Lacrosse is played by men, women and there’s even a variation of the sport for younger children and it is a great form of physical activity. In a similar fashion to hockey, it does have the potential to cause injury because players use a stick and a hard ball but, as long as you follow the rules and wear the correct protective equipment, there is no reason for it to be perceived as any more dangerous than hockey and, perhaps even less so, given the nature of the safety equipment which is worn, although like any other contact sport, the potential for injury is always there. There is a wide range of safety wear associated with lacrosse and the kind of equipment you’ll need to wear will vary depending upon which position you play. As it is played with a stick and hard ball, the most crucial pieces of safety wear for all players are a helmet and face mask. Being hit on the head or in the face by a ball with almost an 8 inch circumference or by a lacrosse stick will be very painful indeed hence why these are the two most important safety wear items. The helmet comes with a chin strap which holds it securely onto the head whilst a face mask should have a centre bar running from top to bottom and it’s this bar which is designed to stop the ball from hitting you in the face. Other main areas which need protection are your hands as they could suffer serious injuries if thick padded gloves were not worn given the element of danger posed by opposing players who are both holding sticks and competing for the ball. If you play in goal, you’ll also need to wear padded pants and both thigh and chest pads to both protect against flailing sticks in goalmouth scrambles as well as being more at risk of the ball being aimed at you because of the nature of being a ‘goalie’. Apart from these fundamental items of safety equipment, the rest of your attire can simply consist of a T-shirt and pair of shorts, although most players also choose to wear elbow pads to protect them against opposing players’ sticks. Lacrosse sticks are also much longer than hockey sticks and come in both short and long stick sizes depending upon your position and also your personal preference, with a long stick being anything between 52 and 72 inches long. Therefore, with people of sticks this length charging around a field and a hard ball being thrown about via the netting of a lacrosse stick, it’s imperative that you wear all the necessary safety equipment when playing the sport and to also understand the rules as, just as in any other sport, rules are also necessary in order to protect a player’s safety so somebody who doesn’t know the rules fully is far more likely to injure another player or get injured themselves. Isn’t It A Bit Too Dangerous For Younger Children To Play? POP Lacrosse, sometimes called ‘Sofcrosse’ (or Softcrosse/Soft Lacrosse) has been introduced into some primary school’s sporting programme as lacrosse at high school level continues to gain in popularity and this variation gives them a chance to get to know the sport at an earlier age. From a safety perspective, parents should not be overly concerned with injuries to their children occurring any more so than with any other sport. 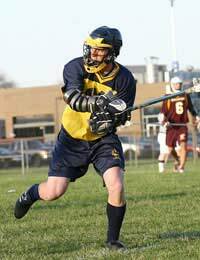 The main reason for this is that the sticks used are plastic-headed and much lighter and this variation of the sport is played as non-contactable so injuries are much less of a risk.The English Lacrosse Association’s website is a useful resource to find out more about the sport which is both good physical exercise and fun to both play and as a spectator sport.